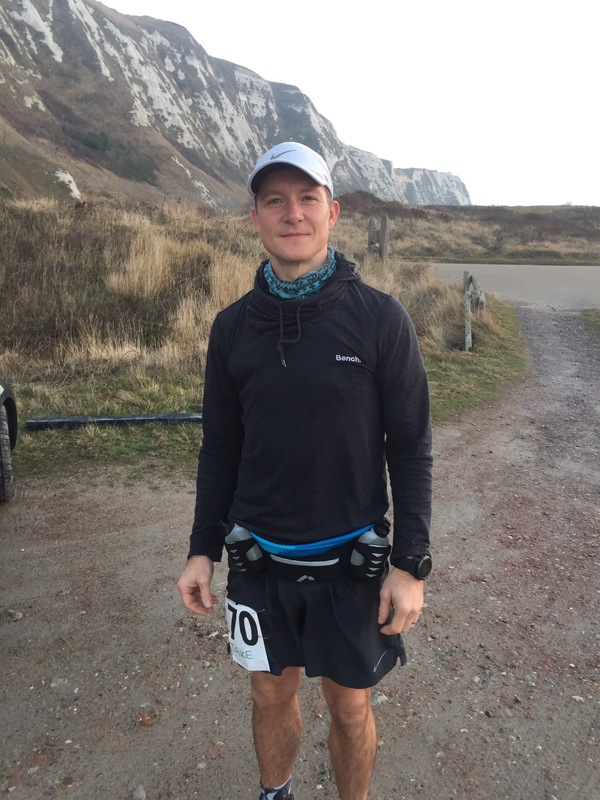 One of my favourite running places and where I completed my first 100 miler is Samphire Hoe and this was where this latest run was so I was looking forward to it a lot. It’s got the rather strange name as it’s for all the regular runners at the Saxons, Vikings and Normans (SVN) races throughout the year- the top 10 runners with the most miles get put on the front with everyone else’s name around them. It’s two days so five each day. The medal is amazing. Anyway it’s about 45 mins from our house and my wife was volunteering at the race so we set off at normal work time to arrive an hour before the race like I like to do, much to my wife’s horror as she likes her lie in. Arrived well in time and remembered the £2 parking this time, picked up my bib and stamp card and went to chill in the car and look at my new SVN tshirt. 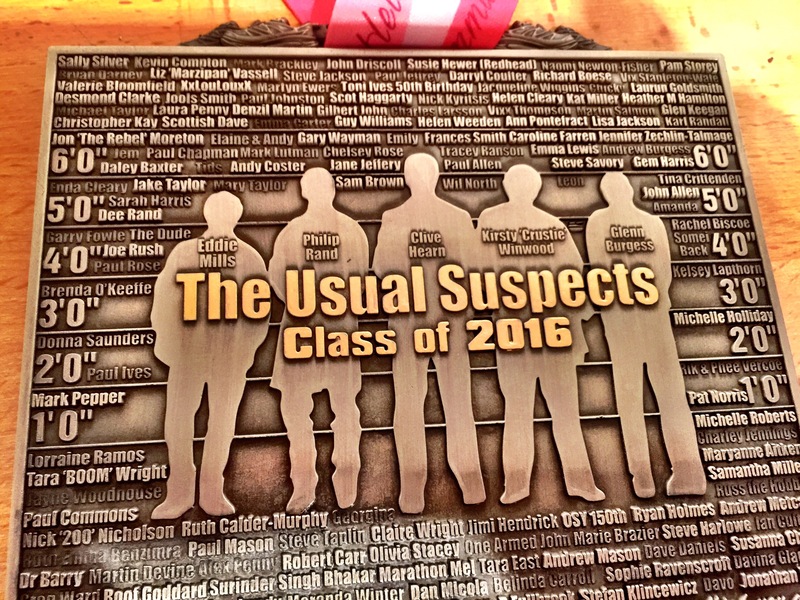 I’ll post a pic of the tshirt on my NYE race as I’ll be wearing it then. We went in eventually and I stood by the newly lit fire hoping for some warmth as it was a tad chilly though the forecast was sun and (for once) no wind. 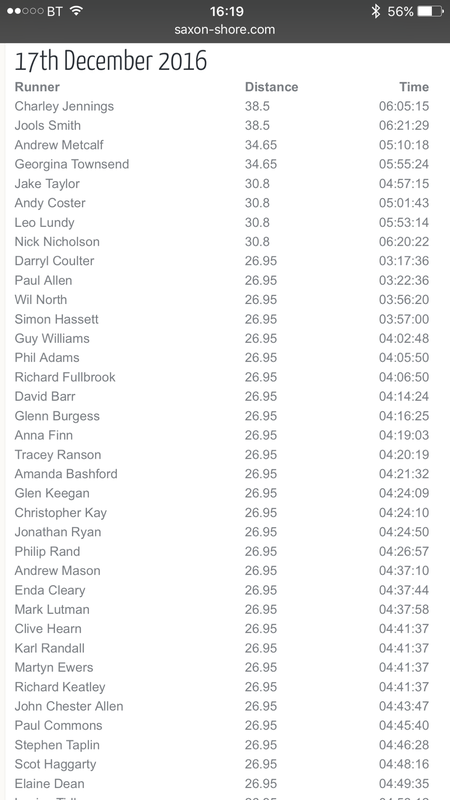 Many end of year awards given out, so well done to everyone for that, especially Philip Rand for not only doing 200 marathons in the shortest time but also for getting there early to help set up and leaving late to pack down for most of the SVN races this year. Much respect. I was trying a different nutrition strategy this time, instead of carrying two full heavy bottles on the front of my UD backpack I just packed 4 bottles in my ammo case – two 600ml and two 420ml hydrapaks full of Tailwind so I could carry them singly after an hour. This worked very well for me so I’m using it going forward. Set off at a decent pace with 8 laps to go for the ultra of 30 ish miles which was my plan today. 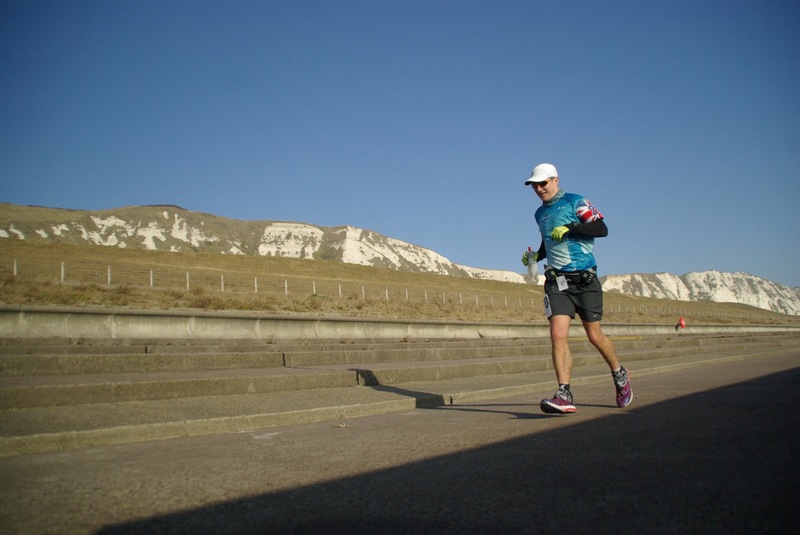 Here’s me rocking my 100 miler tshirt. All going well, though as the day wore on it got hotter and hotter, so I started unwillingly slowing down bit by bit. I couldn’t understand as I had my nutrition dialled in (thanks Tailwind) but I was definitely slowing down so I chomped a Clif Bar down and stripped off my arm sleeves & my buff but kept my gloves on as there were a few chilly moments in the shadows of the cliffs. Soon business was as normal as I was on my 7th lap (marathon) and feeling great. 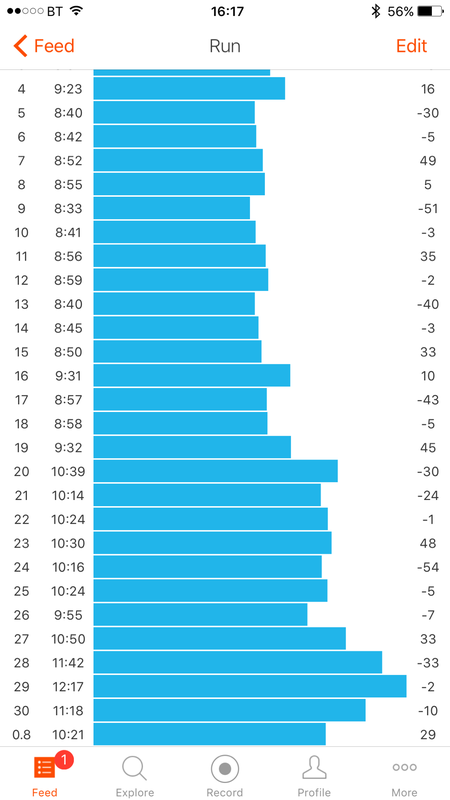 Started my 8th lap and immediately regretted making that decision and really wanted to turn back and call it a day at marathon, but I couldn’t as by then eveyone will have finished and I’d just have a bad marathon time behind everyone else. So gritted my teeth and relentless forward motion began. My new motto when it gets tough. I decided to take it uber easy as I’d done marathon now and in a decent time (no one had overtaken me that I knew) so I could relax down to a 12 min mile and just grind it out. I was fine until I got to the turnaround point with about 2 miles to go and I saw Georgie (who was rocking the same 100 miler tshirt due to a last minute Facebook call out I did the night before) who shouted “who couldn’t do an ultra in this tshirt?” as she zoomed past looking full of beans and like she could catch me up. There goes the nice and easy pace and I start to pick up my feet and increase my speed so I can actually finish this race and have a pint to celebrate no one overtaking me! My splits show I did speed up a little at the end but I needn’t have bothered as Georgie didn’t overtake me and ended up doing 35 miles anyway so 10 laps! The even better thing about this run was that I came first for my distance for the first time ever! Made me very happy indeed. So happy man came home and chilled out with my wife and cats. 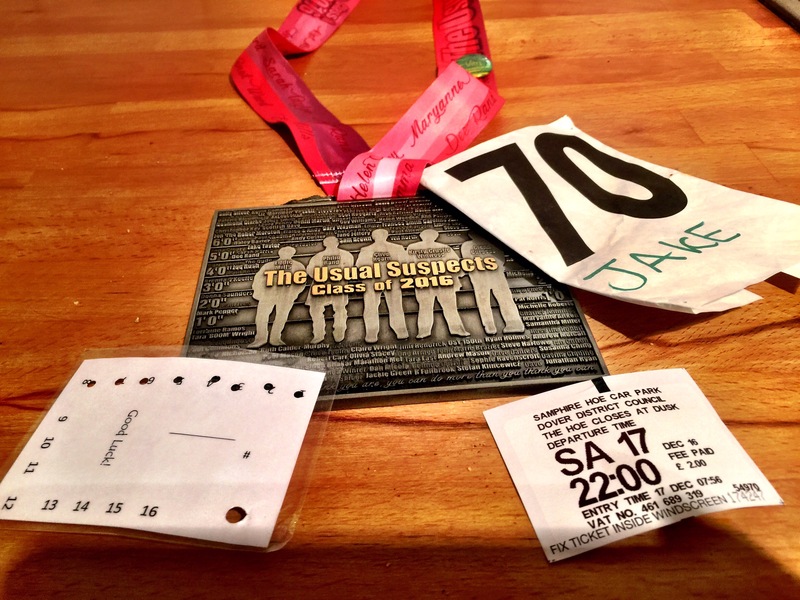 Marathon/ Ultra number 38 done. This week I’ve been taking it easy as my toes were a little sore afterwards, I ran/ walked 6 miles on Sunday with my wife HR training and I walked to work and back yesterday (6.5 miles x 2) and just now done 6.4 miles at heart rate, though I was going to do 10, but my toes were niggling and I was sensible and stopped as I’ve not had a single injury this year and don’t want to end the year with one when I’ve done so far so good! This week I also reached my mileage goal as I went over 2000 miles which is amazing for me! Now as it’s nearly Xmas I’m not doing that much running but I’ll try to do at least an hour before and after Xmas day and my next marathon is New Year’s Eve AM and then one at 10AM New Year’s Day! We fly out to Disneyworld on the 2nd Jan for our Dopey Challenge! Until then run strong and have a lovely Xmas.